Take a saute pan and place your oil inside. Take half of your potatoes and lay them on the bottom, place the onions on top, and then place the remaining potatoes on top of the onions. heat on medium high heat covered until potatoes begin to brown. Then add your garlic, bacon, corn, and basil and stir in. Continue to cook covered stirring every 2-3 minutes. When the pan begins to dry out add the water with the bullion cube and stir scraping the bottom of the pan. When the potatoes are done place the finished product in a plate and then add your eggs to the pan. Cook to desired likeness and place on top of the potatoes. No need for bread with this dish. 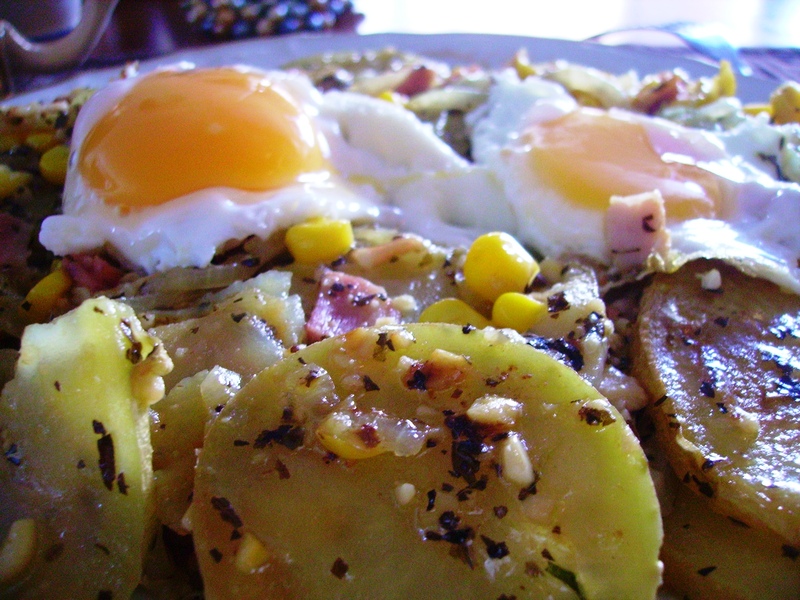 This entry was posted in Bacon, Basil, Beef Broth, Breakfast, Cooking, Cuisine, Dinner, Eating, Eggs, English Bacon, Extra Virgin Olive Oil, Food, Fried Potatoes, Garlic, Herbs & Spices, Kernal Corn, Meat, Olive Oil, Onions, Potatoes, Recipes, Stock, Vegetables, Yellow Onions. Bookmark the permalink. Thanks for your insightful subject. Then you will have a wonderful weekend 🙂 Thanks for stopping by and let me know how it goes. This is our new “favorite” breakfast – thanks for posting. I love your blog. I have added you to my blogroll and hope you will do the same. I have also subscribed to your blog. Again thanks. Hello cheesemonger. Thanks for the Kudos. What is the link to your blog? All this and I just have to add the toast. Mmmmmm! Potatoes and eggs are my favorite breakfast!